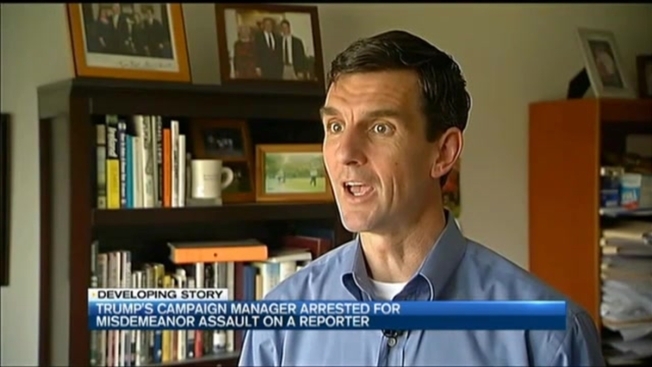 Former New Hampshire Republican State Party Chair Fergus Cullen is reacting to the arrest of Trump campaign manager Corey Lewandowski who turned himself into police Tuesday in response to a March 8th campaign event in Jupiter, Florida. "The culture of the Trump campaign has been very aggressive and one of their tenants is, never apologize for anything," he said. Police say Lewandowski can be seen on security cameras grabbing the arm of a Breitbart News reporter, Michelle Fields, who says she was trying to ask Trump a question. According to the police report, Fields is quoted as saying to another reporter, "I can't believe he just did that… that was so hard, was that Corey? You should have felt how hard he just grabbed me." Cullen says a simple apology could've made the whole thing go away, "But instead, not only did they deny any incident had happened, but they blamed the victim and then accused her of being delusional." A different account of what happened from Trump's New Hampshire campaign co-chair, State Representative Stephen Stepanek. He said, "If that's battery, then the press better look out, because there can be hundreds of charges brought against press people who push, pull, bang, whack trying to get to the candidate." Shortly after the arrest, Trump tweeted: Why aren't people looking at this reporters earliest statement as to what happened, that is before she found out the episode was on tape? Stefanak explains, "That she was pulled, knocked to the ground or thrown to the ground and she never denied and quite frankly, I didn't see that." Michelle Fields tweeted back: Because my story never changed. Seriously, just stop lying. Trump also released a statement saying: "Mr. Lewandowski was issued a notice to appear and given a court date. He was not arrested… (He) is absolutely innocent of this charge." Former New Hampshire House speaker Bill O'Brien, a chair of the state's Ted Cruz campaign, added that in all the years he's known Lewandowski – he's never seen him angry adding, "I would describe Corey as first and foremost a gentleman." Stepanek says he does not think any of this will hurt the success of the Trump campaign going forward.